Fifteen year old Alexa Longueira was just doing what teens do—she was walking along texting one of her friends. And the DEP crew on Staten Island was doing what they do— preparing to enter the sewers to protect (DEP = Department of Environmental Protection) and serve. What they did wrong was to remove the manhole cover BEFORE they put out the orange safety cones. And what Alexa did wrong was continue her walking and text without looking where she was going. 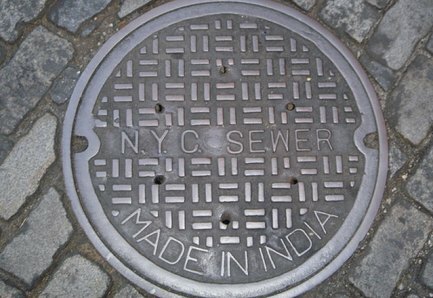 Without pausing her texting, she plunged through the open manhole and into the yuck below. She must have been using a Blackberry because iPhones surely have an open manhole app to warn of things like that. Or they should have. Fortunately, Alexa suffered only fright, a few scrapes and some foul smelling clothes. Her family, of course, is going to sue. The same thing happens to us in our Christian life if we aren’t careful. We can be rambling along not really paying attention spiritual and walk right into one of Satan’s traps. Brian Simmons, in the Pepperdine video we watched Sunday night, told about a man named “Bob” who was just walking along, not realizing that he was becoming more and more friendly with an attractive co-worker until they went on a business trip together. Before he knew it, we tumbled through the manhole into the yuck below. If we aren’t waling carefully, those kinds of tumbles await us all. In Ephesians 5:15-16, Paul says, “Be very careful, then, how you live—not as unwise but as wise, making the most of every opportunity, because the days are evil.” Literally, what Paul says is “Look carefully then how you walk” (ESV). Commentators actually seem split as to whether the adverb “carefully” actually modifies the word "look" or the word “walk.” Is Paul saying we are to “look carefully so we can walk” or to “look so we can walk carefully?” Well, if Alexa had been doing EITHER, she would not have tumbled into the manhole. And if Bob would have done either, he would not have tumbled either. One of Jesus’ most favorite command was, “What I say to you, I say to everyone: ‘Watch!’” (Mark 13:37) He warns us to watch out for a lot of things-- false prophets (Matt 7:15), those who deceive us (Matt 24:4), coming of the Lord (Matt 24:42), not to fall into temptation (Matt 26:41). Spiritual inattention invariably leads to a fall. Ask Alexa or Bob... or yourself.